Buenos Aires | Information...Super, Flyaway! 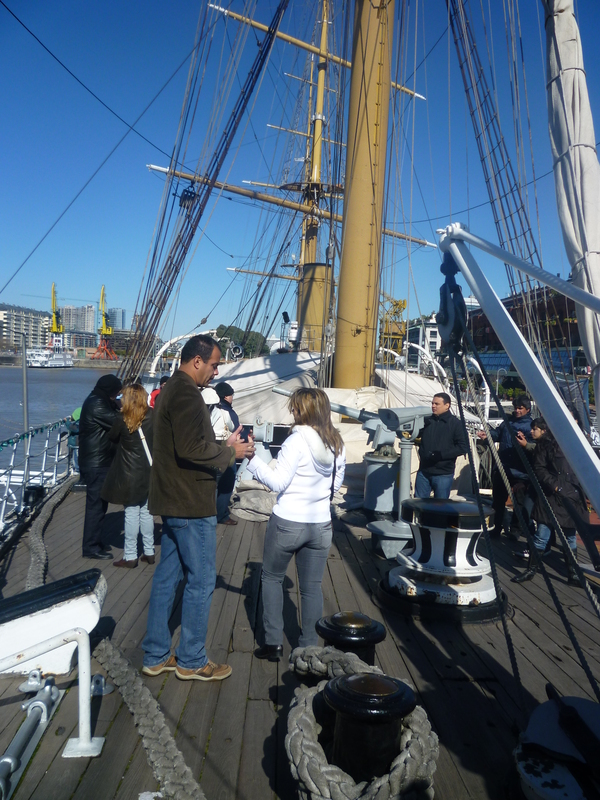 Buenos Aires – Eat, drink and Tango! 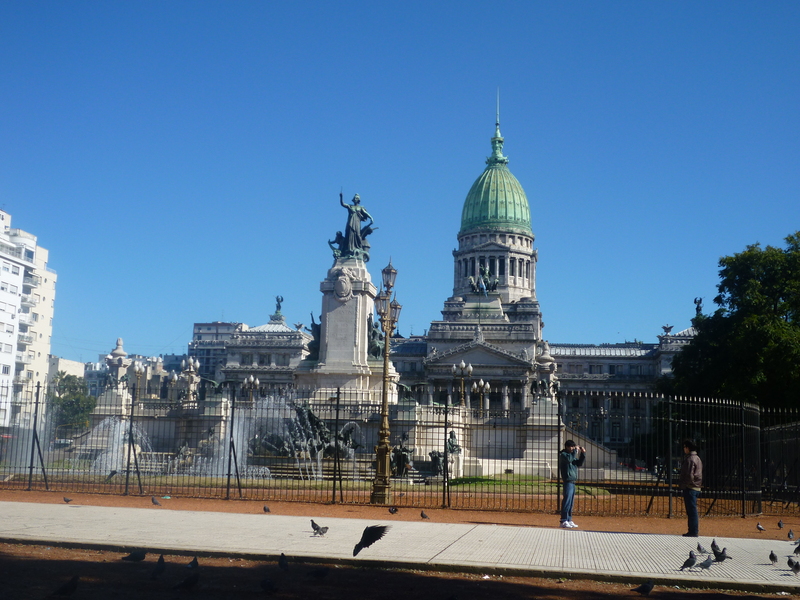 During my 6 month trip around South America I stayed in many wonderful and exciting places, but Buenos Aires by far was one of my favourites. It truly is a magical city and you have to experience it for yourself. 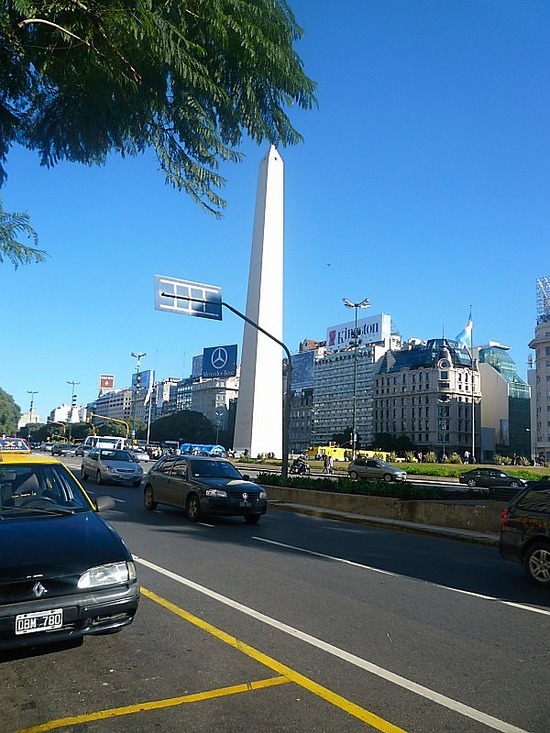 I travelled to Buenos Aires by bus from Puerto Iguazu, taking 17 hours. 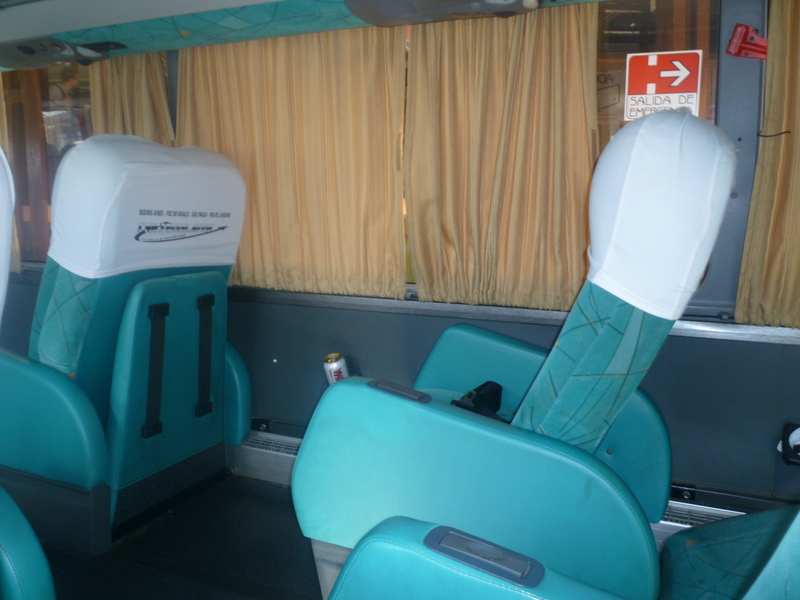 I was looking forward to my first Argentinian bus experience, because I’d heard so many good things about them, but it turned out to be disappointing. My seat was broken, so every time I lowered the seat down flat to sleep, it slowly rose back up into a sitting position. I would fall asleep laying down and then wake up 30 minutes later sitting upright! I had also heard good things about the food on the Argentinian buses, so for that one trip I took very limited provisions – I would usually pack some snacks and water to get through the long hours. I started to get worried when they still hadn’t served anything at 10pm – I was worryingly trying to work out how I could ration my 4 remaining pieces of a mini Toblerone to last 17 hours! At 10:30 they finally served food…and it was worse than aeroplane food; some kind of indescribable meatloaf and rice…ugh. If you’re travelling in Argentina by bus, make sure to pack provisions! 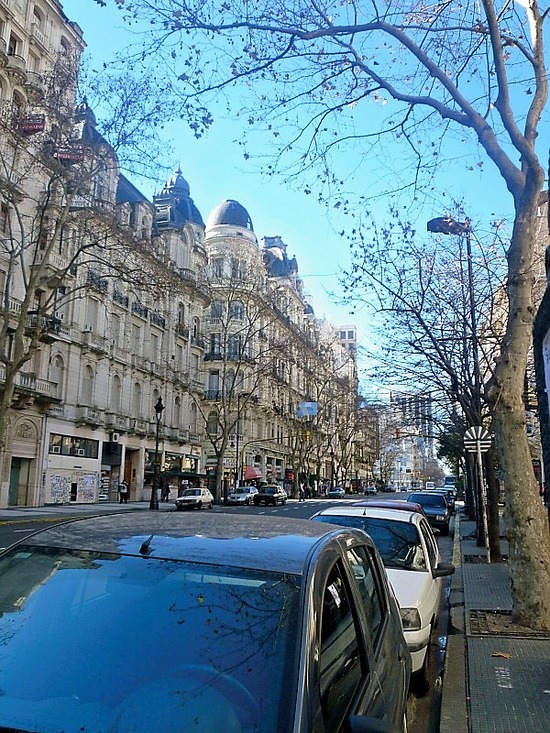 Buenos Aires (or BA, as travellers call it) has such a lovely atmosphere for a city; it’s infectious and you can feel it the moment you arrive. It’s an extremely easy place to navigate; a huge 20 lane highway runs right up through the middle to a huge obelisk and dotted around are beautiful palaces and stately buildings. A pretty decent subway/underground system runs to most areas of the city and cabs are decently cheap. The best form of transport is by far the city buses, from which you can see BA in all of its eclectic wonder! The architecture is very European influenced, with tall grand buildings with ornate sculpturing and iron balconies. 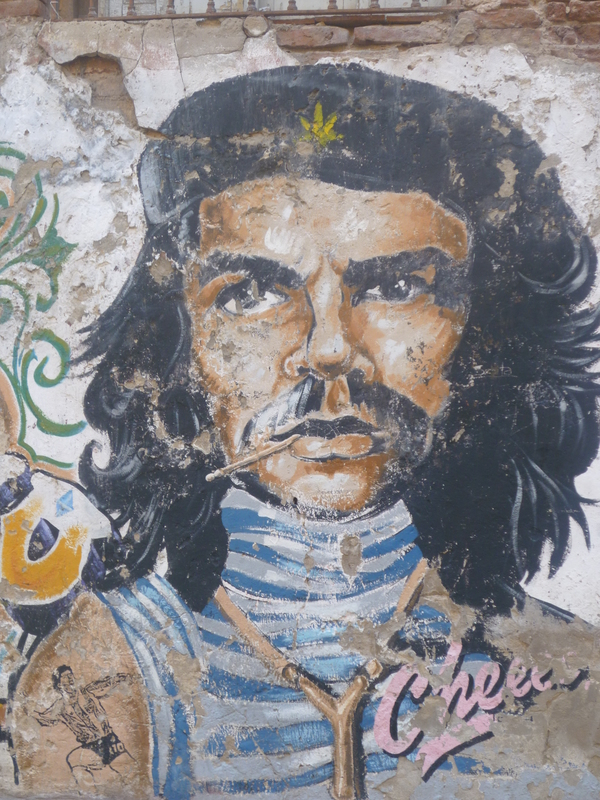 But everything has a slightly rougher edge to it, with unkempt shutters and walls adorned with political graffiti. 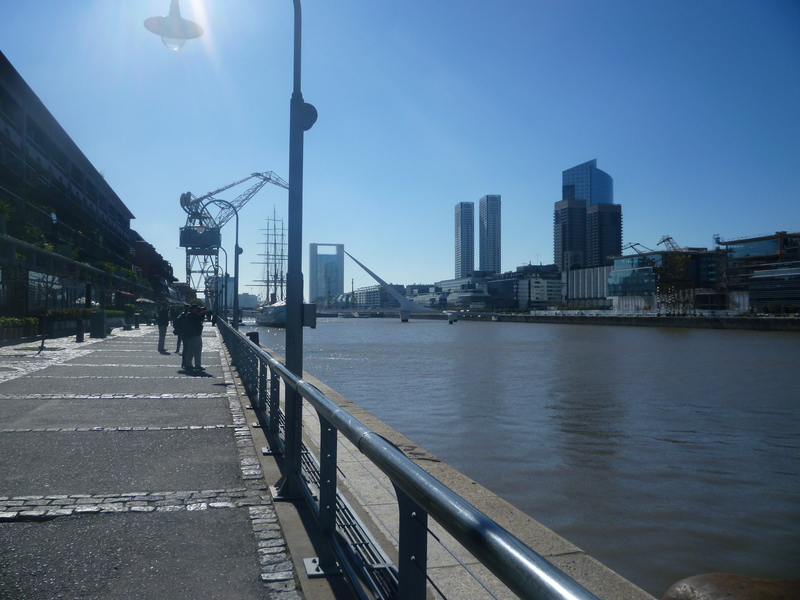 At the Eastern edge of the city is a brand new district called Puerto Madero, which sports huge glass skyscrapers and a modern marina, with restaurants and up-market shops. 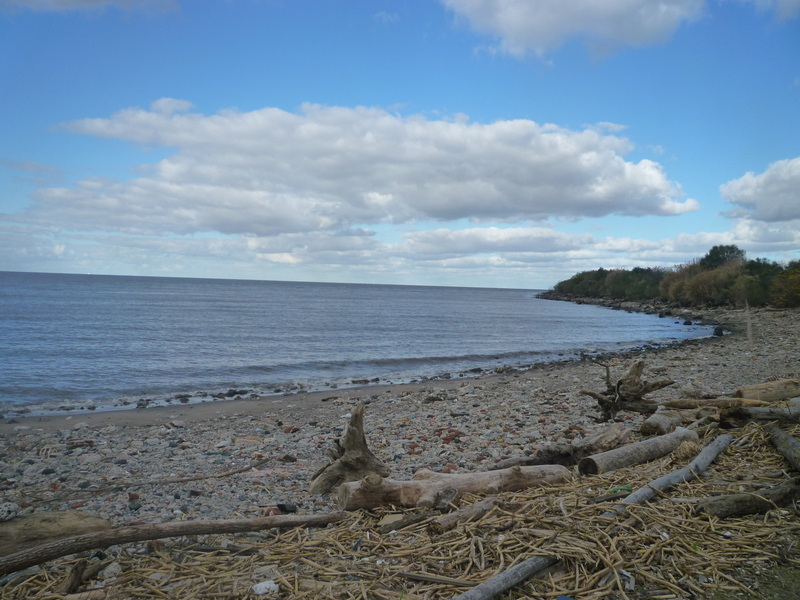 Beyond this, out into the water of the Rio de la Plata river is an ecological reserve and across the river, Uruguay! You literally have everything you could think of, all in one amazing city! I stayed in a hostel called PAX in San Telmo, which is the bohemian district – you can wander through street after street of markets and strange little indoor bazaars. They sell everything from old doors and benches, to huge swords and old foreign currency (I found an old 50 pence coin from England whilst digging around). I wandered these markets with an Australian guy called Daniel who I first met several weeks before in Brazil and who happened to be staying in the same hostel as me; such is the coincidental life of a traveller. We were both pretty disappointed that we wouldn’t be able to buy a sword as a souvenir! 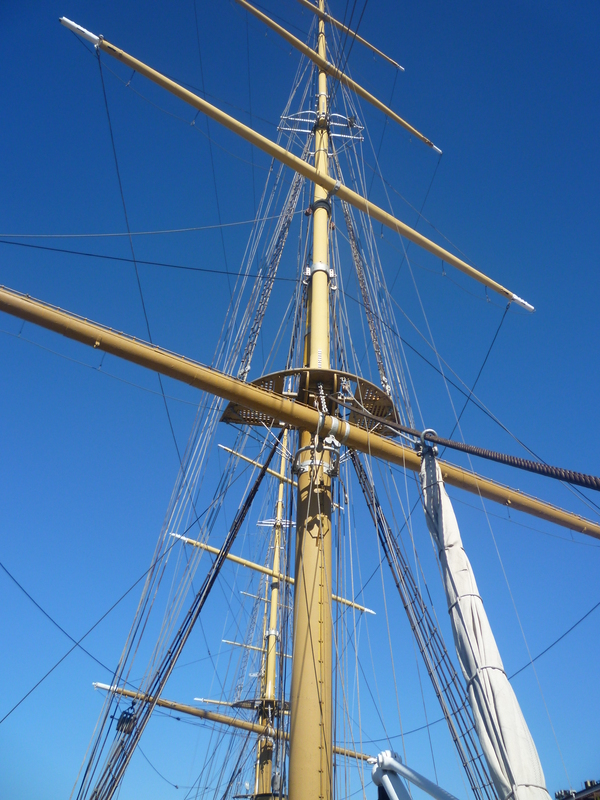 Following the markets, we strolled down to the marina and looked around an old Argentinian Naval boat from the 1800s – it is easy to while away hours just walking around the city – you never know what you’re going to find! 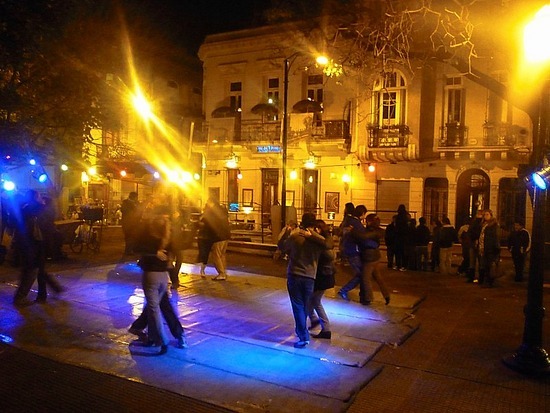 In the evenings in San Telmo there is a lot of activity and live music on the streets – I walked through the district one evening and saw an 8-piece salsa band, a Brazilian drumming band, and a spontaneous tango dancing session. The tango was breathtaking to watch; someone had simply lain down some cardboard as a dance floor and strung a set of fairy lights from a lamp-post in a small plaza. The music came out of a little boom box and soon various couples stopped to show off their tango skills. They would hold each other close, cheek to cheek, but their bodies would move so smoothly across the floor, and the women did lovely ‘flicky’ motions with their lower legs – it was so romantic! I spent the most part of one day in BA out cycling with a couple of other guys from my hostel, Simon and Gustav. 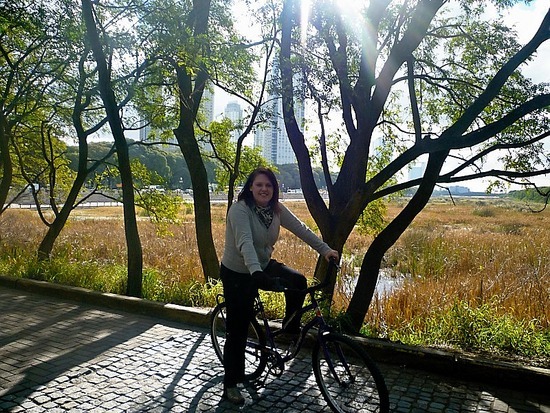 We hired bikes from our hostel for less than £5 for the day and decided to take a look at the ecological reserve. 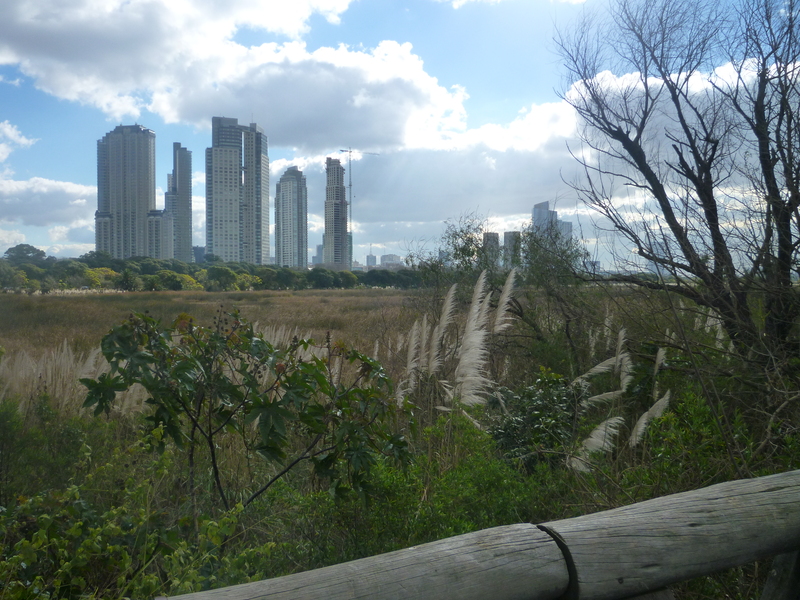 We cycled out in the reserve, to the beaches of the river, stopping for a snack from a food van and passing the huge glass towers and the marina in our loop. I clearly had no luck with seats because my bike seat kept tipping backwards until I was cycling with my knees around my ears, clown-style! We negotiated a crossing of the 20 lane highway in the centre of the city by closing our eyes and wishing for luck! Another day I decided to take a bus down to a district called Recoletta. I wasn’t too sure about the route I had been given so I asked the bus driver in my limited Spanish if he stopped at Recoletta. He said he did and I was happy with my first real communication in Spanish being such a success. This soon turned to embarrassment when the driver pulled the bus over in the middle of a street (holding up traffic! ), called me to the front of the bus and pointed enthusiastically at the street ahead of us. It was very sweet of him to give me such special treatment but I’m not sure the crowded bus of busy Argentinians appreciated it as much! 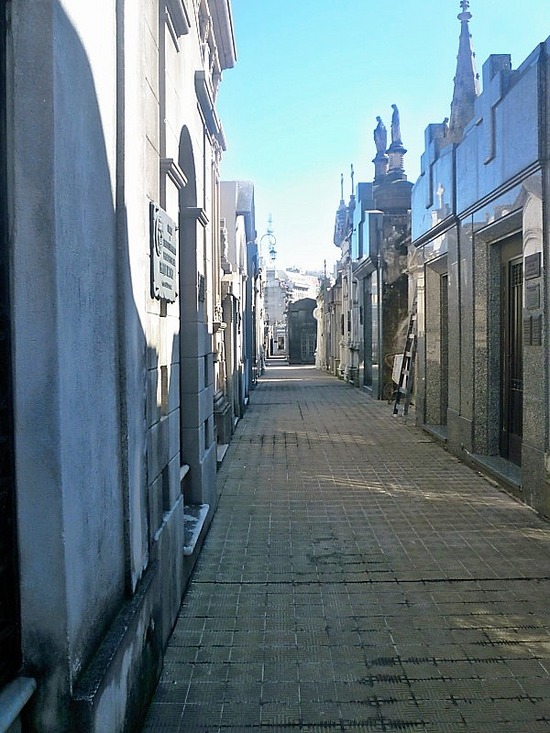 The main draw for Recoletta is a huge cemetery full of mausoleums for many of Argentina’s most prominent citizens, including presidents, politicians, and (most notably) Maria Eva Duarte Peron – otherwise known as Evita. As I neared the entrance, I was approached by a man collecting money for children with Aids; I felt I should contribute and so gave him some of my spare American currency. 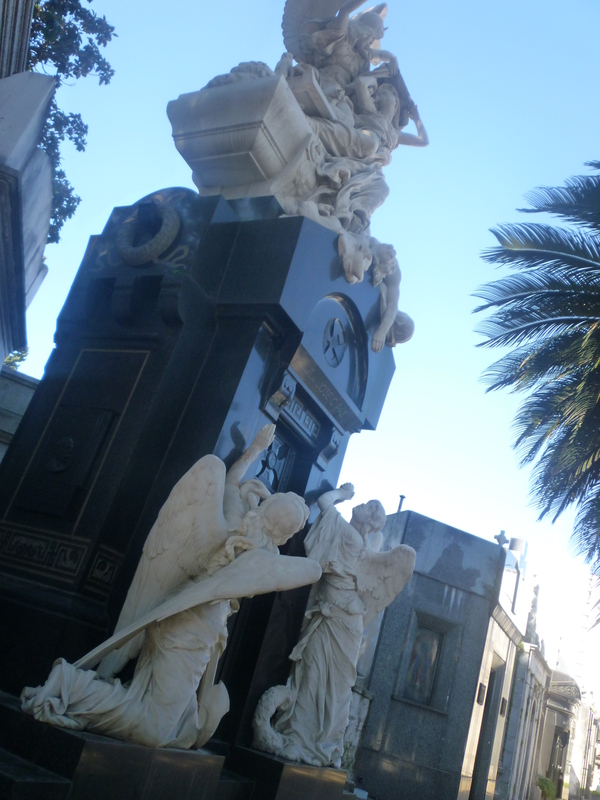 However, he then proceeded to grip my hand, kiss my cheeks SIX times, touch the side of my face, and tell me I was beautiful…only in Argentina can you get propositioned outside a cemetery for handing over less than $10! 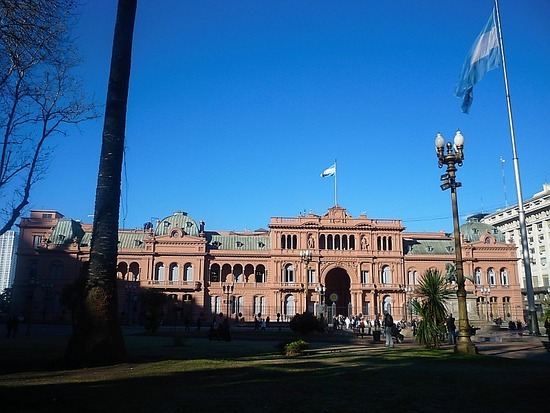 However, you notice how tactile the people are in Argentina – even the men kiss several times when they greet each other. The cemetery was beautiful, which sounds like a strange thing to say. 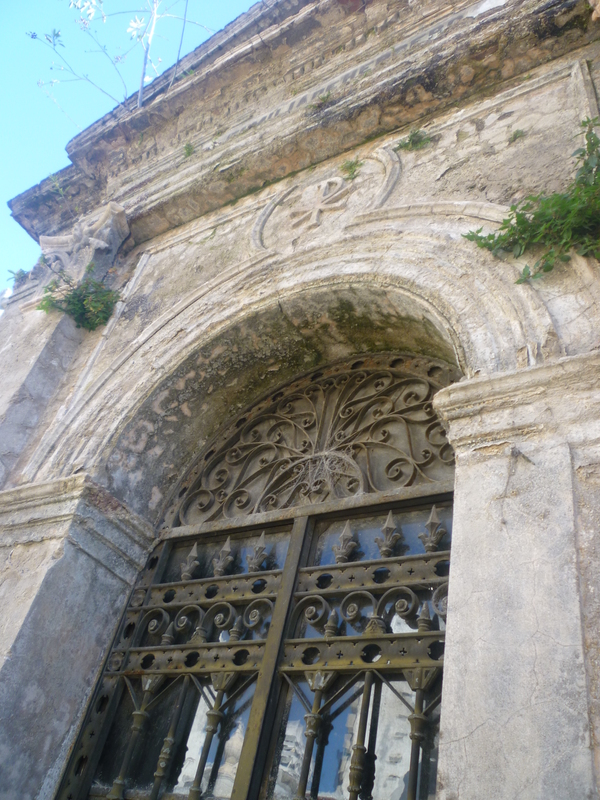 The mausoleums are absolutely huge; some the size of small two-storey buildings. They even have staircases inside that go downstairs to underground crypts. They have glass doors in the fronts and the coffins are prominently displayed inside, with alters containing photographs, personal items and religious offerings. 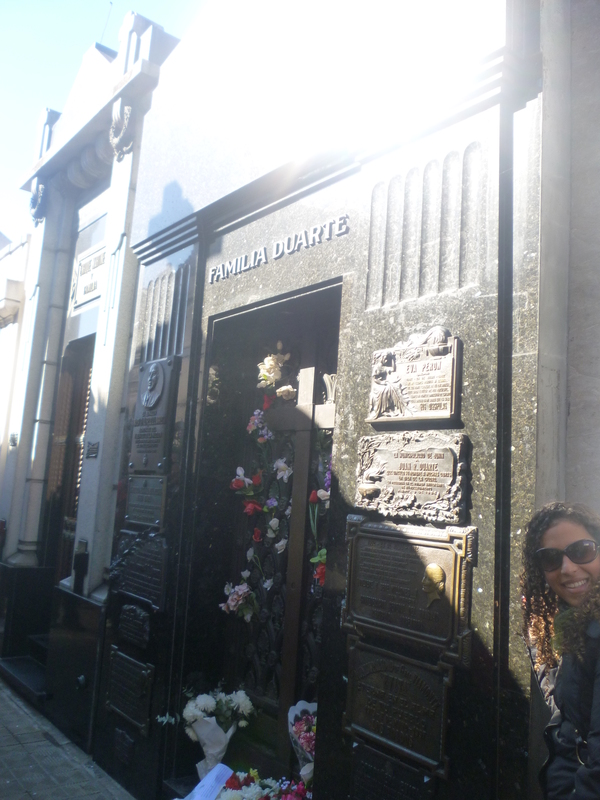 Evita’s mausoleum was surprisingly small and understated, considering her popularity in both life and death, but it is apparently the only one that is always covered in flowers. 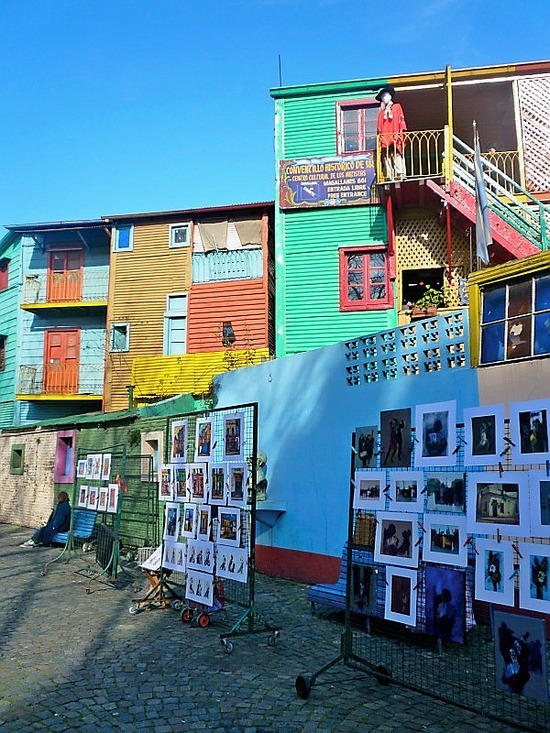 In the South Eastern edge of the city is a neighbourhood called La Boca, which carries with it a real Bohemian vibe with wide pedestrian streets and brightly coloured houses. The area is quite a tourist haven, with many places selling tango-related objects and there are many bars, restaurants and taverns. You’ll also find a lot of street artists selling their wares and street performers to entertain you. 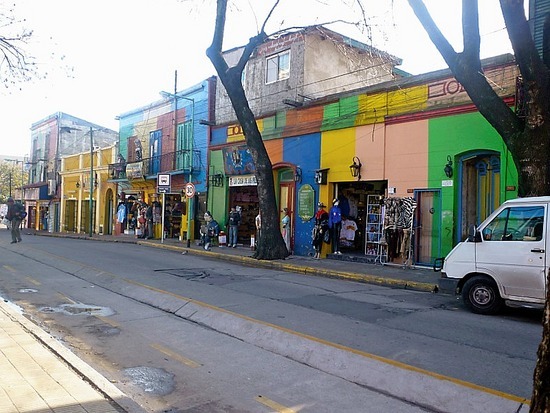 I took a train down to La Boca one morning and spent the day wandering the area – at first I was a bit unsure, as people told me that the area had been considered unsafe for tourists. However I found it felt safe to walk about the area alone and the people were perfectly friendly! If you like trinkets and an arty vibe then this area is definitely for you! I stayed in BA around August time and the weather had been great; bright blue skies and clear days, with plenty of sunshine. But it was still absolutely freezing! Gone were the flip-flops and shorts that I had been living in for the previous month in Brazil – that 17 hour bus ride had definitely taken me south into the cold. At one point I thought I had gotten used to the weight of my backpack, because it was surprisingly easy to lift…then I realised it was because I was now wearing half of my clothes in order to keep warm! I went shopping in the Centro district to get some new clothes because the people in BA dress really well and I was sick of looking like a typical messy traveller. I braved the nice shops and worried about having a pretty woman experience, with glamorous shop assistants who would be mean about me – but the women couldn’t have been nicer! I had an amusing experience asking for skinny black jeans in Spanish and one assistant groping me to figure out my size! My evenings were spent either socialising in the hostel or heading out to restaurants, bars and dance halls with people from my hostel. One thing that surprised me about the city was the timeline of an evening; no one eats until after 10pm at night and people sit in restaurants and cafes eating food and drinking coffee until gone midnight. They don’t tend to drink alcohol very early in the evening. Clubs and bars open at around 2am and that’s when the Argentinians start to drink – they pace themselves a lot better than people back in the UK! People never really get home or to bed before dawn. Needless to say, I did not see my bed before 5am for several days in a row and my body clock officially broke! 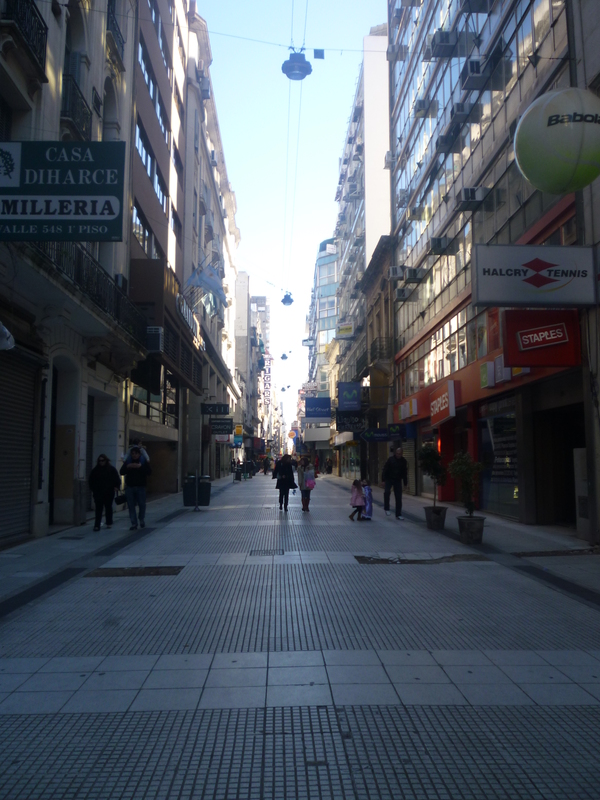 Life in Buenos Aires is a crazy ride but you can’t help but be swept along with it; the place is addictive. Sadly, as is the case with travellers, my little group of friends at the hostel started to disperse, moving on to various other destinations following a week of BA life. When travelling you become attached to people so quickly, getting to know them in a blink of the eye and bonding through shared experiences. Then all too soon it is time to part – it is such a mixture of up’s and down’s. I left the city and moved West into Argentina for more rural experiences. 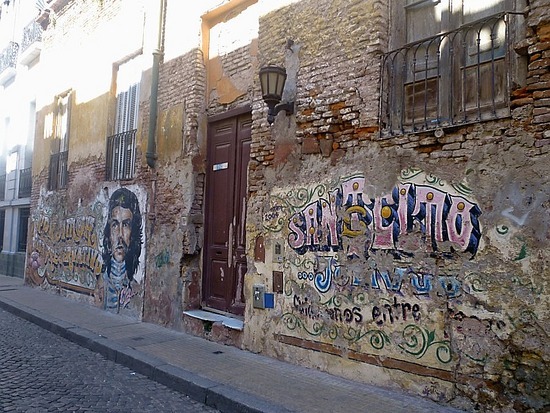 If you’re visiting Argentina then BA is a must-see stop – even if it’s just to watch the Tango!